This post is partly to confirm that I’m still alive, and partly as testament to a cracking afternoon in the Berlin sun. Problem is, I was tweeting during the game, and most of what I said there (if you read it) is very similar to what I would write here. If you didn’t read it, you can check out my Twitter timeline here. To be honest, I only knew this game was taking place as I seen an advert on the way to work. 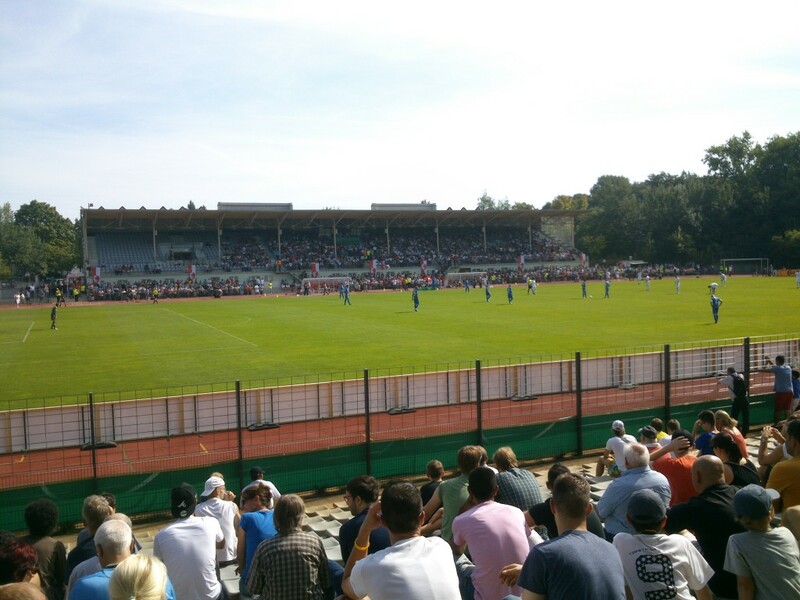 Berliner AK 07 are my ‘local’ team, I would guess, being based in the Poststadion in Moabit, and play in the fourth tier of German football (as far as I can work out, as below the third tier it goes into regional divisions). Hoffenheim, while not a huge club, have been a fixture in the Bundesliga recently, and are famous for having a stadium with a greater capacity than the population of the town. Supported by their rich benefactor, they have become a mid-table force in the German Bundesliga. Still not heard of them? Liverpool sold Ryan Babel to them. No? Markus Babbel is the manager. Still!?? Ok,it’s where West Ham signed Demba Ba from. That’s as much detail as you’re getting as I’m lazy. So, to distract you from that, here’s a pic of their fans before kick-off. 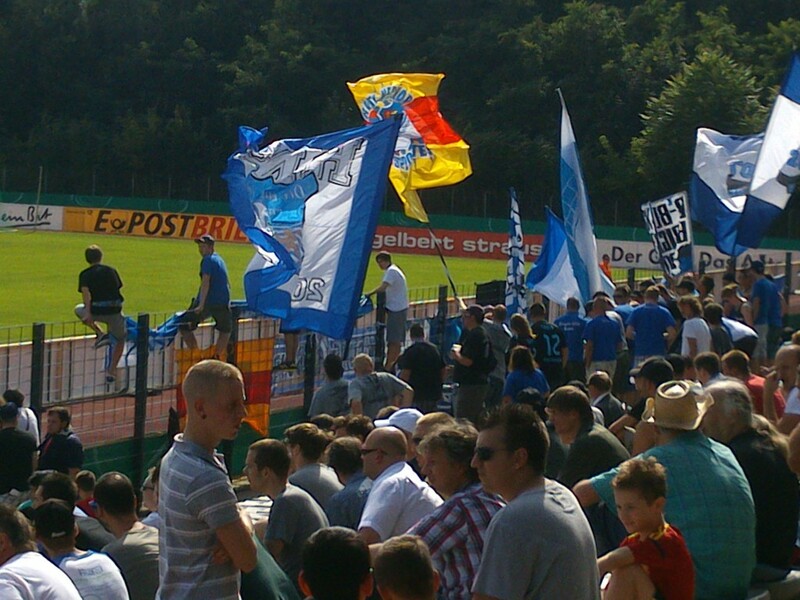 Hoffenheim fans before kick-off. Yesterday. The day before today. Look at them there, with their flags. They had no idea what was about to happen. 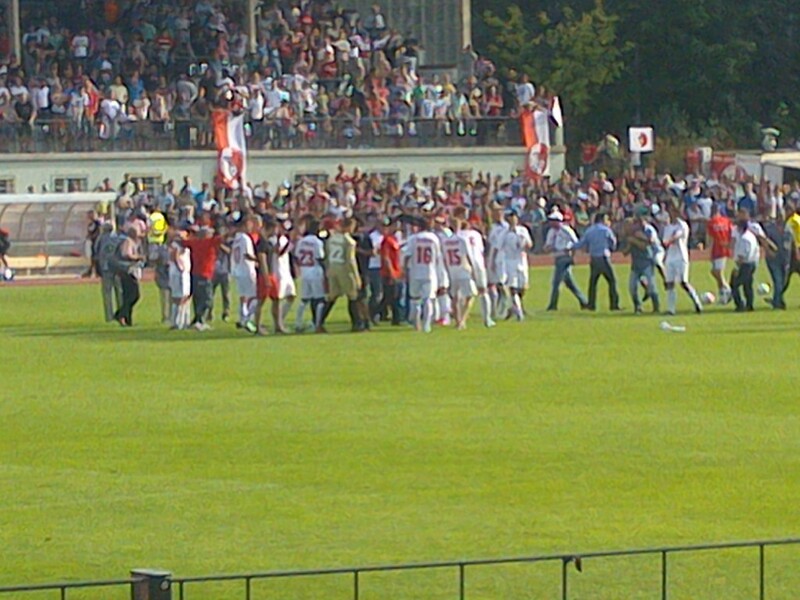 Anyway, as I was (probably) saying, the Poststadion is not far from me, so I wandered down there to check out the first round of the German Cup, mainly as I had time to kill until Toon beat Spurs. I had a ticket for the away end, which was really just a mix of football fans, with maybe 200 Hoffenheim fans, all told, together somewhere in the middle. As there were no set places, people could sit or stand where they wanted, so I chose to stand leaning against a fence at the back of the corner, about level with the six yard line. Mainly so I could get some pictures for you lot. I’m nice like that, you see. Me getting pictures for you lot. Yesterday. The day before yesterday. Hoffenheim started slowly, with no real fluency in their passing or movement, and the Berlin club were a lot more fluid and fast, which was a bit of a surprise, especially in 34-degree sunshine. In fact, if I was being generous to Hoffenheim, I would say the match balls used looked a bit flat, and the grass seemed a bit long. But where would the fun be in that? There’s little excuse for Hoffenheim’s sloppy play, and Berlin took the lead after 3 minutes when a volley from a half-cleared corner looped over keeper Tim Wiese (hair grease shining in the midday sun) and in off the bar. Hoffenheim never really got going and Berlin deservedly added a second after half an hour, which I didn’t really catch as I was waiting for a beer. The beer van was behind the goal, and separated by a fence and advertising hoardings, so all I could really see is the lad’s head bearing down on goal, occasionally blocked by Tim Wiese’s greasy head. Then Wiese’s head dropped down, and the Berlin lad’s head broke into a smile as he ran off to celebrate. You don’t get descriptions like that in The Times do you? Berlin’s left winger, who had a canny game against Alexander Beck (who I rate) managed to break through just before half-time, and saw Wiese get a hand to his placed shot, which then rolled in-off the post in what felt like some kind of The Matrix slow-motion sequence. Half time came with most of the people in the ‘guest stand’ in disbelief and very cheerful moods, with the exception of the Hoffenheim fans who were in disbelief and rage, with several climbing the fence to shout at their under-performing players. To be fair, their fans were noisy all through the first half, albeit using the same three or four songs, but come the second half they had fallen into shocked silence. I was busy catching my breath at halftime (and drinking beer) when a load of police came running past me to the area where the Hoffenheim fans were. The general conversation was that a smoke bomb had been let off. 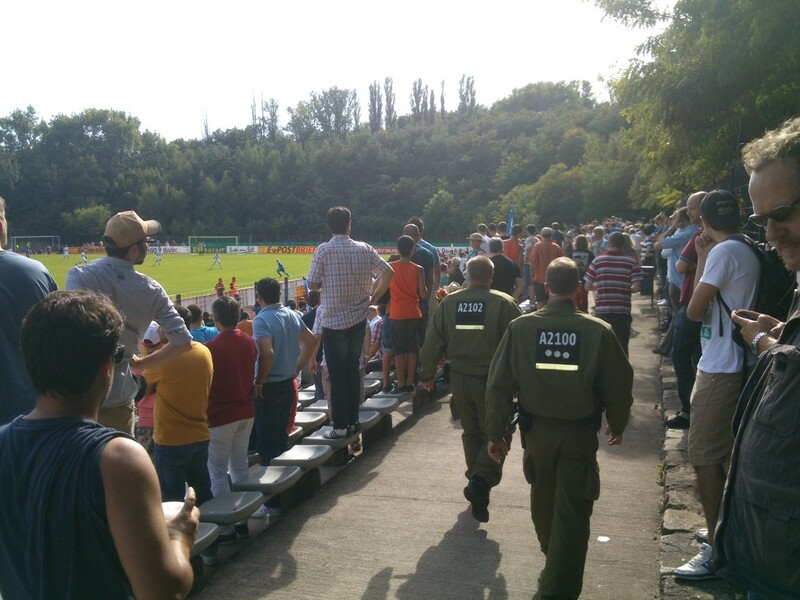 Police presence at Poststadion. Not the riot police. Yesterday. If today was Sunday. A few minutes later, the riot police were in front of me, which was quite surreal as I was enjoying my midday beer and keeping the good folks of Twitter updated. I was starting to get worried as I was trapped between them and the fence, but after a few mins (and one of the women coppers had finished her tab), they marched on in the same direction. They returned a few minutes later with about six students, none of whom were Hoffenheim fans, and escorted them to the far corner (near the beer stand), from where they were forced to watch the rest of the match. Investigative journalism at its finest. In all the excitement, I missed Tim Wiese (who seems to be universally disliked) pass his goal kick straight to Berlin’s striker, who put it past him into the corner to complete the rout after 50 minutes. This is why I love football, as it throws up such moments of joy and disbelief. The German Cup actually saw quite a few shocks over the weekend, as all teams playing in the third division or lower have the right to play their tie at home if they play one of the ‘big boys’, which evens the (long-grass) field somewhat. For the rest of the game, Hoffenheim pushed forward without looking threatening (with the exception of the tricky Usami, who was brought on at half-time), and Berlin broke often, without being able to add to their lead. In fact, Erin Derdiyok (who Toon were linked to) played the whole game for Hoffenheim, and I didn’t realise until about halfway through the second half. At the final whistle, the whole ground (including a few Hoffenheim fans) applauded, the Berlin players celebrated, and the highly-paid professionals trudged off the pitch without a murmur. Celebrate good times, come on! It’s a celebration.Yesterday. But the day before that. 28 years old. Geordie. Lived in Berlin almost three years. All-round canny lad. This entry was posted in Football and tagged Berlin, Berliner AK07, German cup, German police, Germany, Gingers in the sun, Hoffenheim, Is yesterday tomorrow today?, Markus Babbel, Moabit, Poststadion, The Matrix, This is why I love football, Tim Wiese is terrible, Tim Wiese's hair is terrible, Twitter, WHAT!? REAL BEER? ?, Yesterday. Bookmark the permalink. Nee mention of Shola. B- is all I can give. German Cup is always crackers with big teams going out and high scoring games. Aye, and you’re right. It’s hard to write about football when you know Shola’s not involved, no matter how many goals or giantkillings. It’s like the bible without Gollum.